Easy Hi-Q Recorder is the easiest way to record sound directly to: MP3, (Constant Bitrate: CBR or Variable Bitrate: VBR), WMA 9, WAV or OGG Vorbis. At the high-end you can record to actual CD quality stereo and at the low-end you can record all the way down to 8 Khz mono. The quality is excellent at all settings! Record streaming Internet audio or video broadcasts or webcasts of any kind, whether it's news, sports, music, talk radio or any other format, (records audio only). 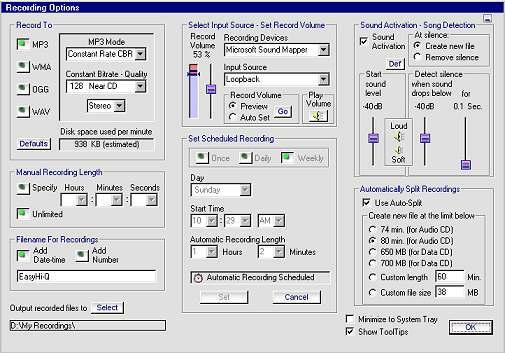 Record audio or video sounds from Windows Media Player, RealOne Player, Winamp, QuickTime or any other media player, games, etc. Convert, (record), LP's, any records, tapes, CD's, radio, DAT, Mini-Disc, video tape sounds, T.V. sounds, video games, telephone, microphone or from any other external device. You can also use it as a universal audio or video sound file converter. There is also a built-in VCR-like timer so you'll never miss one of your favorite broadcasts again! You can set it to record once, daily or weekly. 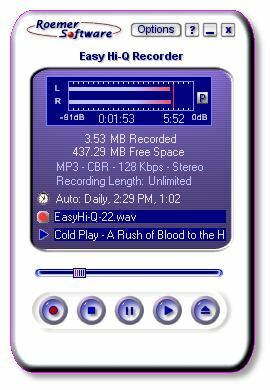 Easy Hi-Q Recorder also includes some advanced new features such as sound or voice activation that can automatically create new files for each new song or sound detected, silence detection and removal, file splitting and more! Record and save music that is ready to transfer to your Apple iPod, Rio, iRiver, Sony or any other portable MP3 music player! WMA, OGG and WAV are also supported in many portable players. Record sound directly to: MP3, WMA 9, WAV and OGG Vorbis. Easy Hi-Q Recorder is so easy to use, all you have to do to is click Record to get started! Now runs on Windows 7 and Vista! Now featuring Hotkeys, Shortcut keys! Hotkeys make it easier for the visually impaired or anyone to use. More Screenshot - Click each image to enlarge!